T.G. was rescued when he wandered into a feral colony in Bellerose, this tabby boy with his eyes full of love always seems to be happy. He kneads with all four paws when he’s eating, and chirps back to you when you speak to him. 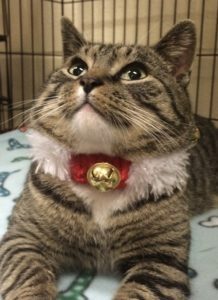 A young adult estimated date of birth December 2015, he would make a wonderful addition to any family with his easy-going personality. It turns out T.G. walks with a slight limp, but, he can run and jump onto your lap without a problem. X-rays showed a healed fracture in his left thigh bone. Most likely he had been hit by a car and never was taken to a vet; so the bone healed but has a slight curvature which makes him walk a little funny. No further treatment is needed. But a HOME is needed for sweet T.G. This entry was posted in Adopted, Adopted Cats, Adult, Cats, News, Wantagh Adoption Center. Bookmark the permalink.